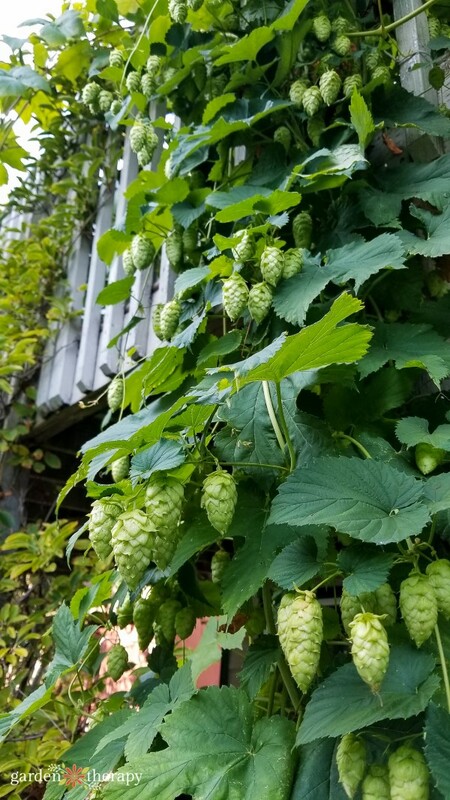 Hops is a plant that no herb garden should be without. And it’s not just because it makes great beer! 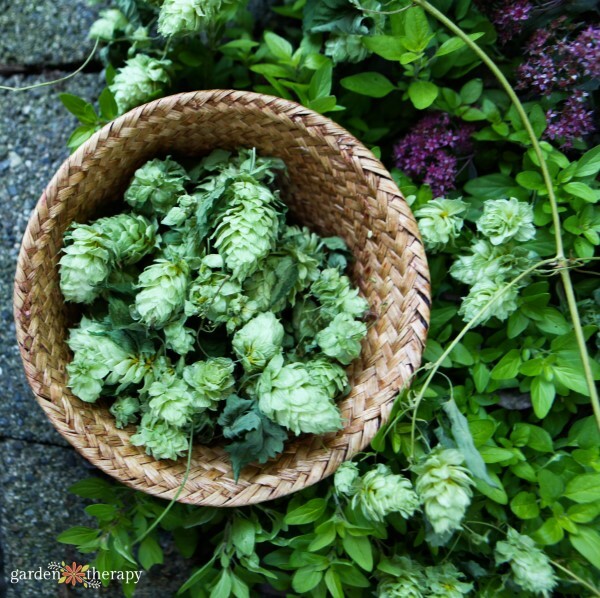 There’s so much more to know about hops as a wonderful ornamental garden plant and powerful healing herb. 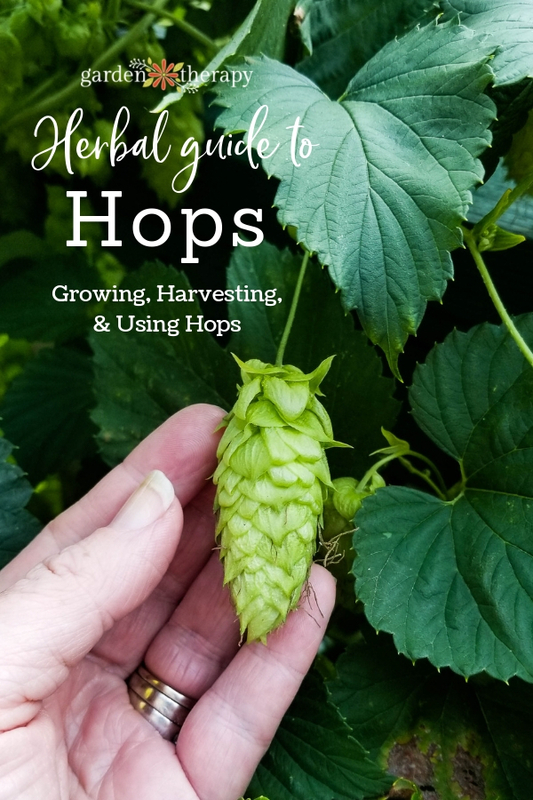 This guide to hops will show you why you should absolutely grow it as an ornamental, how to harvest the strobiles, and how to dry and use hops for insomnia and anxiety. Over ten years ago, I went on a garden tour where the homeowner had a beautiful arbor covered in the most gorgeous golden flowers that looked like paper pinecones. I was drawn to this arbor and as I stood underneath it I was able to breathe in the aroma that can be described as none other than hoppy. It’s not a sweet or floral smell, and yet I was immediately relaxed. The combination of the prolificness of the plant, the beauty of the arbor covered in flowers and green leaves, and the heady, bitter smell of hops was intoxicating. 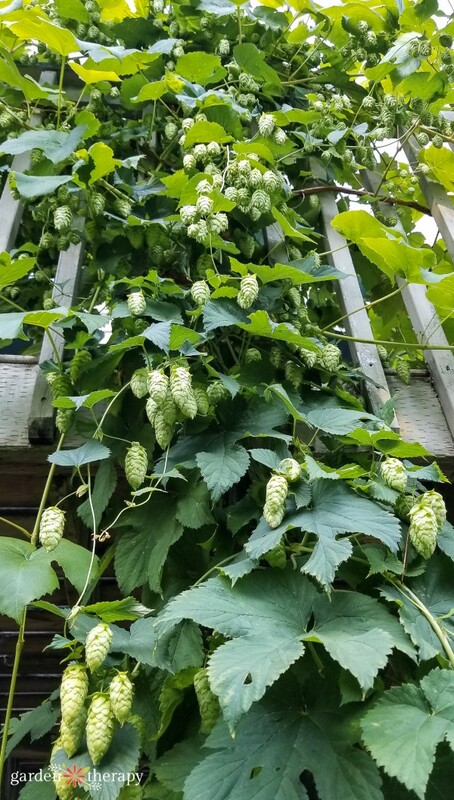 It was at that moment that I knew I wanted hops in my garden too. I didn’t grow it with the intention of making my own beer, but instead for the beauty it provides as an ornamental. The flowers dry to a warm golden color and hold their shape well. The bines stay intact when cut and it makes them perfect to wind around a grapevine wreath for festive fall decoration. 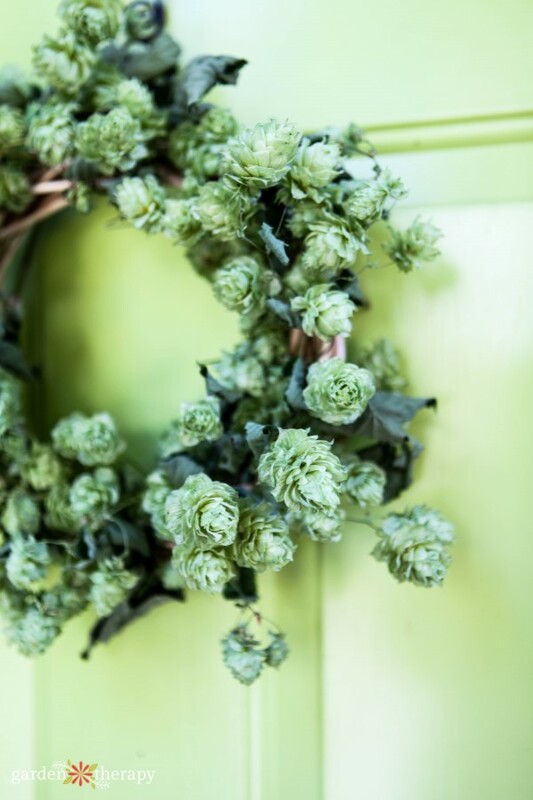 Because of the sheer volume of hops that the vines produce in a season, I have dried many flowers and tested out many recipes. My favorite is to tuck them into sachets in my pillow to help aid insomnia. Like many people, I’ve struggled with anxiety and insomnia. Daily stresses, money troubles, family trauma, and chronic pain have done their part to make it hard for me to sleep some nights. I do work hard to keep healthy sleep habits because sleep is so important in order for the body to heal. Including hops in a variety of ways has been really good for me, but please keep in mind that hops’ strong sedative properties means that they may not be the right herb to use for people with depression. If you’re looking for something to help you slow down and rest, hops is the way to go. Especially when you grow this prolific plant in your own garden. 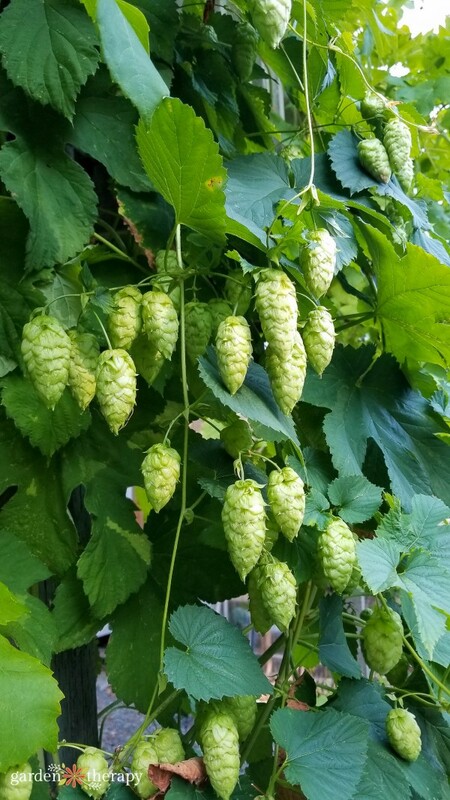 Hops (Humulus lupulus) can reach staggering heights in a short growing season. They grow on climbing bines (not vines) where the stems wrap around support structures (like pole beans) rather than attaching like a vine by tendrils or suckers (like peas). 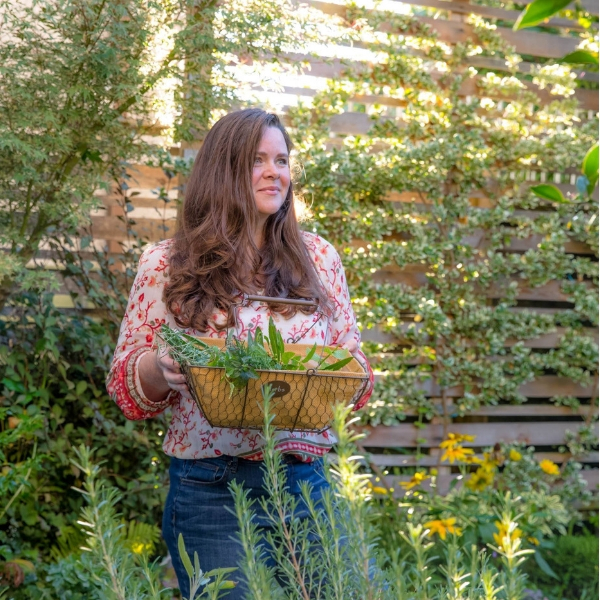 Build a tall trellis or arbor and they will fill it up quickly. The plants are hardy in Zones 3-8. They like deep, well draining soil in full sun. 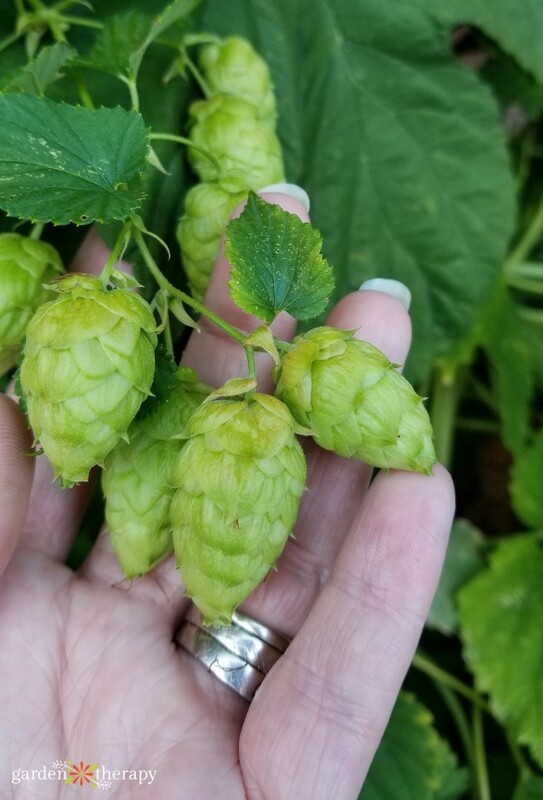 Hops can be started from seed but they could grow into male or female plants. Female plants produce the strobiles, or the leaf bracts surrounding small flowers. Instead, take a rhizome division from an established female plant, you don’t need a male plant for flowering. Hops are in the same family as cannabis and hemp so if you have grown cannibis you may find hops has some similarities. Harvest hops when they have ripened on the bines in the late summer. Do not pick them early or they will not ripen. They are ready to pick when they are papery, springy to the touch, and a bit sticky. They should smell distinctively hoppy when they are ready. Check them by smelling first, then gently squeezing one between your index finger and thumb to test how they feel. You can pick ripe hops one by one, or remove bines from the plant. Unless you are making beer, you should have plenty to leave in the garden in the fall and winter as well. I only take a small fraction of the plant to use, and leave the rest to overwinter. I hang my hops to dry in my studio and it provides decoration, aroma, and a perfect spot to dry them. You can also use a food dehydrator or oven dry hops if you are in a hurry. More hop drying methods can be found here. The herbal part of the plant is the strobiles that hold the flowers and pollen that in turn contain lupulin, bitters, resin, and oil. The herb is used for calming: reducing anxiety, encouraging sleep, taming an upset tummy, and even helping to temper sexual desire. Keep this in mind when you are planning to use hops as an herb. If you have excess energy that could use balancing out, hops could be very helpful. As a tea, hops is quite bitter and the flavor can be hard for some people to tolerate. Its bitterness is actually a plus when it comes to digestion, though. Bitter herbs help to stimulate digestion, so you can use it to make homemade bitters and take ½ teaspoon before meals. 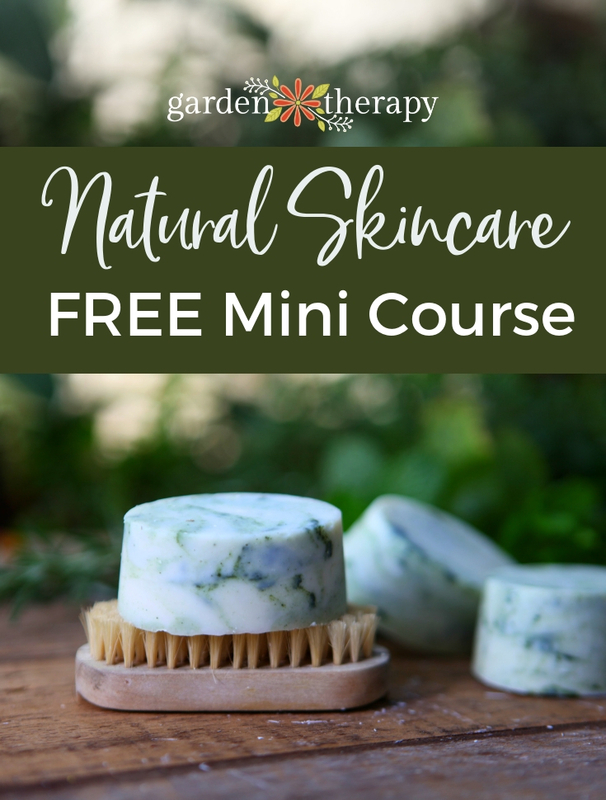 Hops is a wonderful herb to use in natural skincare recipes as well. Try infusing oils with hops to use in soap and healing salves. Hops’ calming effect works on the skin as well to reduce inflammation and help with both wrinkles and acne. 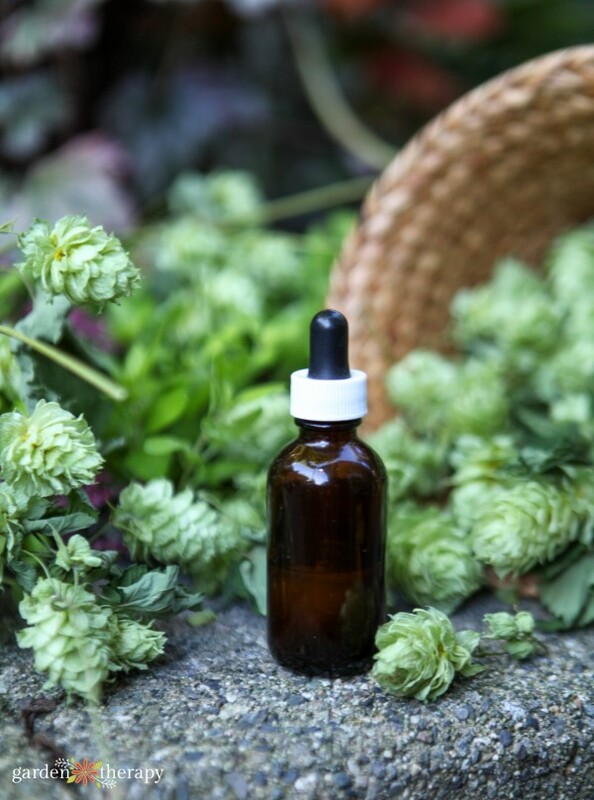 For anxiety and insomnia, you can try taking a hops tincture, or making a dream pillow to fall asleep with at night. I’ll be sharing my dream pillow ingredients and the DIY instructions later this week, so be sure to come back to see that project. Hops are great, but pet owners should be aware that they can be poisonous to dogs. My son is a medically discharged military vet who has PTSD. He’s a recovering alcoholic, which was his way of self-medicating for the PTSD. I wonder if growing hops would help his anxiety and sleep issues or trigger the alcohol cravings? He finds gardening very therapeutic.